Which is the Best Scroll Saw for You? When it comes to intricate detail work, there’s nothing better than a good scroll saw. Whether you’re creating a piece of veneer, making puzzle pieces, or cutting an elaborate pattern for a wood screen or door panel, a scroll saw gives you the precision and versatility to make the smallest, most intricate cuts you can imagine. From closed holes to tiny shaving adjustments of a larger curve, these are the detail-oriented woodworker’s best friend. However, when you’re working on such a small scale, it becomes even more important to find a saw that won’t let you down. You don’t want to waste hours of painstaking work just to end up with a messy cut line because your scroll saw vibrates too much! Scroll saws are also some of the most temperamental power tools you can buy. One needs to learn safety tips. With such delicate blade mechanisms, lots of models jam up, break, or vibrate so much that you can’t make an accurate cut. These are also some of the most disposable tools on the market, so it’s super important to find something durable and reliable. We’ve put our team to the task of compiling a list of our favorite scroll saws on the market right now. We’ve looked at all sorts of options, from 16” models to 20” models, from all the major brands, and all the off-brand competition. In this guide, you’ll find our comprehensive, detailed reviews of each of our three winners. You’ll also find our helpful guide to shopping for the best scroll saw, as well as an extra “ultimate” recommendation for passionate woodworkers who want a scroll saw that will last for life! Our top budget recommendation for a scroll saw comes from WEN, one of the most popular power tool companies for budget buyers at the moment. They make decent, no-frills models which have a lot of the same features as high-end saws at a fraction of the price. While this unit isn’t premium by any stretch, it provides decent quality and versatility to beginning woodworkers, and it’s easy to tinker with to improve the flaws in the design. It makes a good beginner’s scroll saw for folks who want to get into woodworking, but aren’t ready to commit to a $300+ scroll saw just yet. It’s less than a third of the price of our other recommendations. We’ve found that under ~$250, nearly all scroll saws are rickety, unreliable tools. They’re highly breakable, and have lots of design flaws. With that in mind, we think that if you’re going to go cheap, you should spend the least amount possible for a decent saw. If it breaks, it’s easy to replace. And when you outgrow it, you won’t feel like you’re throwing away too much of an investment when you upgrade. It has a cast iron body. That’s a big upgrade over the lightweight aluminum you’ll find on most budget scroll saws. It dampens vibration, and gives you a sturdy workspace to cut on. This one also comes with bolt holes pre-drilled, so you can easily attach it to a countertop or table. There are also lots of stands available for it. It has a 16” table depth, which allows you to work on moderately large workpieces. That’s enough for most beginning woodworkers, and it’ll give you room to grow until you’re ready to bump up to a more expensive 20” model. It’s reasonably powerful, and it has a very respectable cutting capacity. You can cut stock up to 1.9” thick, even hardwoods and other tricky stock. Previous buyers didn’t report any lag, which is something that can’t be said of a lot of other budget scroll saws. The table bevels up to 45 degrees to the left. That’s the same capacity as most full-size scroll saws, and it provides plenty of versatility for new woodworkers to experiment with angles. It has variable speed controls. The WEN allows you to choose speeds between 400 and 1600 SPM. We think that’s an ideal range for new woodworkers to explore, so they can get a sense of which speeds are best for which types of cut. It keeps things cleaner than other budget choices. There’s an air pump and hose built in, which blows debris away from the cutting area. This one also has a dust collection port, so you can hook up to your shop vac. While it’s not the best vacuum system on the market, it does make a big difference in keeping your workspace clear. There’s a flexible work light onboard. It adjusts on a worm joint so you can position it however best suits the task at hand. It works with pinned and pinless blades. We also love that you can store blades inside the tool. A pull-out drawer stores all your blades in one convenient place, so you never have to hunt for one mid-project. It has a foot clamp for keeping your workpieces in place as you cut. It’s very light. At less than 30 pounds, this one is ideal for the casual, novice woodworker who might not have a dedicated workspace to keep the scroll saw out. This one’s easy to lift in and out of storage each time you use it. It’s covered by a 2-year warranty, and WEN have a surprisingly good reputation for customer service. Previous buyers said the company responded quickly to support requests, and provided replacement parts promptly when necessary. While you never want to have to use your warranty service, this is one of the only entry-level units that won’t leave you high and dry should something go wrong. The clamp isn’t very well-made. Previous buyers said it’s clunky, and doesn’t always hold workpieces firmly. You’ll probably want to tinker with the screws on this one, to get yours fitting more securely. On the plus side, the lack of a great clamp will force new woodworkers to develop sure handiwork. The blower is a bit weak. It’s not as effective as the pumps on more expensive units, so it doesn’t move all the dust off your workpiece. The speed control is jittery. Some buyers found that their speeds stalled, or were intermittent. That’s down to cheap gears, as you’ll find in any budget unit. We think this one does better than other budget options, but the imprecise speeds are one reason we don’t recommend it for serious woodworkers who need something more exact. Some buyers reported problems with blades slipping out of tension. The fasteners on this model tend to loosen, especially at the higher speeds. It’s not a safety problem, but it does mean you’ll need to re-tighten pretty regularly. Some buyers found that the blade fastener screws on their units wore out, which means you’ll need to get some replacement parts. Thankfully, WEN were on top of that for most buyers. WEN quality control is rather poor. Some buyers received broken units, or units with defects out of the box. They said that WEN customer service was responsive and helpful, but it’s always frustrating to have to return or exchange power tools. We definitely recommend purchasing additional warranty coverage for this model. You can read more about why we suggest add-on warranties for all scroll saws in our “how to” section, but the WEN’s mixed reliability record and lightweight build quality make it particularly vulnerable over the long term. The dust port is smaller than usual. At 1.5”, it probably won’t fit many standard vacuum hoses, so you may need to purchase an adapter. It has more vibration than more expensive options. This one doesn’t have quite as heavy-duty a work table, and while the frame is made from cast iron, it’s still on the lighter side. As a result, some buyers did find that their worktable vibrated at the higher cutting speeds. This definitely isn’t accurate enough for a professional woodworker, or ambitious DIYer. This Delta model offers a massive upgrade for folks who are looking for professional quality, but don’t quite have the cash to spring for a top-dollar Dewalt scroll saw. The Delta is incredibly sturdy, cuts smoothly, and offers the precision you require at a still reasonable price. We love its clean, all-metal design, as well as the excellent warranty coverage. It’s more powerful than the WEN. The Delta has a bigger motor, and it achieves a higher max cutting speed. This one also has the brute power to back up its speed ratings. You won’t have any problems with anemic power or speed cuts on this model! It has a larger cutting capacity. This one can cut up to 2 1/8” at 90 degrees, and 1 5/8” at a 45 degree tilt. That’s great for folks who want to cut thicker pieces, and with more severe angles. It has a bigger table, to help you with more ambitious projects. This one has a 20” spread, which gives you a lot more room to work on larger pieces than the 16” spread on the WEN. Previous buyers loved how spacious the Delta felt, especially compared to budget models they’d owner previously. They also appreciated how much sturdier it felt at the edges. It’s much more heavy-duty. While the WEN does have a cast-iron body, the Delta is all-metal! It’s got an even heavier base, and all the frame components are metal as well. Plus, you get the massive upgrade of a cast-iron table. Even the small components like the clamp foot and blade holders are sturdier and more reliable than the WEN. All those upgrades make this one both sturdier and smoother, since the heavier parts dampen vibration and noise much better. It tilts 45 degrees to either side, whereas the WEN can only tilt in one direction. That makes it a lot easier to cut angles in multiple directions without having to re-set your workpiece. The bevel gauge on this unit is also more precise than the WEN’s, and the whole table tilts more smoothly through the bevel range. All the little conveniences see a big upgrade, too. There’s a quick-change blade switching system, and the fasteners on the Delta do their job much better than the fasteners on the WEN. It comes with 2 blades, and has an organized storage space for the rest of your arsenal, as opposed to the empty tray on the WEN. The dust control is better than the WEN’s, thanks to a more powerful blower that does a better job staying in place. The clamp works better, too. It’s tool-free, just like the WEN’s, but this one actually stays in place consistently. It’s much more precise than the WEN. The Delta’s heavier overall construction quality dampens vibrations much better, and it has a smart dual-pronged cutting arm which further isolates vibration and disturbance. The clamp improves precision, too, as does the more exact bevel tilt. Overall, buyers who bought the Delta as an upgrade from a cheaper scroll saw were unanimous in agreement that it was a far more professional-grade tool. We found that many full-time woodworkers had chosen this one as their primary workhorse for intricate pieces. It’s covered by a 5-year warranty, rather than the 2-year coverage on the WEN. It’s much, much more expensive than the WEN, to the tune of $250 or so more. It’s a big jump in price, but we’ve found this is how much you have to pay to get a really professional-grade scroll saw. It’s far from perfect. Some buyers ran into motor trouble, and others had problems with the speed switch. As far as we can tell, the 2014 batch of these saws had some electrical problems. However, more recent buyers don’t seem to have had the same problems. You should probably lubricate your unit out of the box. Several buyers reported receiving units that were extremely loud and unsteady from the factory. However, most reviewers found that their problems were solved with a good dose of machine oil. There’s no dust collection on this model beside the blower. Buyers had very mixed experiences with Delta customer service and warranty coverage. To avoid getting the runaround, we’d definitely recommend purchasing a third-party warranty for this saw. This one uses only pin-less blades. The Dewalt is our top quality recommendation for a scroll saw. It’s similar to the Delta (they’re actually owned by the same parent company), but it has more of a loyal following among professional woodworkers. In our opinion, it’s slightly quieter, and more precise. Plus, it has a much better track record for durability, especially where the motor is concerned. We recommend it to any full-time woodworker, or the passionate home DIYer! Dewalt and Delta have recently fallen under the same parent company. That means there’s a fair bit of overlap between the two. The Dewalt borrows the Delta’s dual-link, parallel arm design, which cuts down on vibration and improves precision. It has the same tool-free blade clamps, the same 20” cast iron table, and two-way, 45-degree bevel capacity. It’s got the same motor, the same range of blade speeds, and the same stroke length adjustments. Think of it as a different package with roughly the same specs. It’s even steadier than the Delta. While both models have cast iron frames and tables, reviewers agreed that the Dewalt somehow muffled vibration even better, and was close to perfect in that regard. Professional woodworkers noted they could hardly feel any vibration, even when cutting hardwoods at the high speed settings! That extra steadiness and precision is the main reason we’re giving the Dewalt the top quality nod, even if its specs are the same as the Delta. You can raise the arm for cut-through holes. That makes it easy to change blades, too, and this unit has quick-release, tool-free catches for making sure each blade is securely fitted. We love how conveniently the Dewalt’s controls are located. They’re all on the arm, including the tensioning lever, power switch, and variable speed controls. You can also adjust the blower wand right from the arm of the machine. It’s all a slightly more intuitive arrangement than the Delta’s, which makes the Dewalt more enjoyable to use on a regular basis. It’s lighter than the Delta, even though it does better at muffling sound and vibrations. This one saves about 5 pounds over the Delta, without sacrificing build quality. That’s smart design in our book, though the Dewalt’s plastic casing might not be to every taste. It’s covered by a 3-year warranty, which includes a 1-year paid service contract and a 90-day satisfaction guarantee. That means you’re in much better hands than with the Delta model, which has warranty coverage but not satisfaction guarantee, and no paid maintenance offered. As with the Delta, it’s super powerful, and cuts smoothly at any speed. Reviewers didn’t notice any gearing issues, lag, or motor problems. Previous buyers said that it’ll cut through hardwoods, metal, and any other materials like butter, provided you equip it with the proper blade. One key selling point on this model is that it doesn’t have the Delta’s electrical problems! Previous buyers who had used both the Dewalt and Delta tended to prefer the Dewalt, although some traditionalists stuck to the all-metal Delta. Folks who stuck with the Dewalt said they simply hadn’t used a smoother, faster, or more high-quality machine before. Dewalt quality control these days isn’t very impressive. This model doesn’t have too many issues, but some buyers received damaged units, or units which weren’t calibrated or aligned very well at the factory, which meant that they cut a bit wonky out of the box. That’s all covered by the satisfaction guarantee and the return window, so we’d recommend taking a very thorough look at your saw when it arrives, so you can exchange it for an undamaged unit if need be. It’s an annoyance at this price, but not unusual. Blade alignment is a bit tricky. Some reviewers found that while the front to back knob was intuitive, the sideways adjustments were frustrating. However, since most users didn’t report issues, and since the users with the problem already had misaligned units, we’re going to assume that the problems were a quality control matter, not a design flaw. While the frame and arm are made from metal, the casing is made from plastic. That fits Dewalt’s bold yellow aesthetic, and we’re willing to grant that the plastic feels solid and rugged. However, any big plastic parts do feel cheap on something of this price class. Even at the top of the range, the dust blower isn’t spectacular. We’d recommend rigging a vacuum hose with a crevice tool to the edge of your table, so you can use your shop vac to help out! That’s our current favorite workaround. As with the Delta, it’s probably a good idea to lubricate inside the Dewalt. Only a few buyers reported noise or vibration out of the box, but it’s a good preventive step to take even if your unit runs perfectly. The WEN is our top budget option. It’s at the cheaper end of the budget spectrum, and we’ve made that choice for a reason. Since all budget saws are quite unreliable and finicky, we think you should pay the least possible, in order to minimize your replacement costs. It’s our recommendation to new woodworkers who are shopping for a first scroll saw, but we can’t recommend it to even the most cash-strapped professional craftsperson, since it’s too inaccurate and unreliable. If you’re prepared to make the leap out of the budget range, the Delta offers a sizable increase in cutting capacity and build quality. 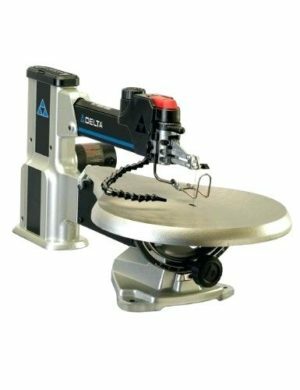 While its cost may make it a hard sell for new woodworkers, it offers experienced DIYers and professionals solid build, quality, lots of workspace, and an extended cutting capacity with the motor power to back it up. There aren’t any huge differences between this unit and the Dewalt at the top of our rankings, but the Delta does have an iffy reliability record where the electrical components are concerned, and it’s slightly less vibration-free. On the other hand, it has more metal parts. You’ll want to think about which one you prefer as a woodworker, since they’re so close in our rankings. The Dewalt is our favorite scroll saw at the moment, so we’re recommending it to anyone who wants the best in stability, power, and versatility. However, it’s not worlds apart from the Delta. In fact, as both companies are now under the same umbrella, so we think it’s fair to expect that both models will evolve to be even more alike. However, specs aside, reviewers who used both machines tended to rate the Dewalt higher. It also has more user-friendly controls, and a slightly better warranty policy out of the gate. With all that said, the pro woodworker will probably already have a preference between Delta and Dewalt, so you should feel free to go with your gut on that decision. Scroll saws are available in a range of sizes, but the most common options are 16” and 20” models. That measurement refers to the width of the table on the machine, and it generally tells you how much room you’ll have to work. Bigger tables also tend to be accompanied by larger motors, and expanded cutting capacities. We recommend 20” scroll saws to most buyers, but the compact size and low cost of a 16” model can make a good introductory purchase for someone who hasn’t used a scroll saw before. Professionals or passionate home woodworkers will almost certainly find a 16” unit limiting, so we recommend full-timers go for the 20” range. As you choose between saws in your size class, you’ll want to pay attention to cutting capacity ratings. Know the sort of materials you want to cut, whether they be metals, woods, or plastics. Know the maximum thickness of your workpieces, so you can find a saw that can accommodate that thick a piece of material. Be sure to consider angles when you look at cutting capacity, since most scroll saws can’t cut quite as thick a workpiece when set to a 45-degree tilt. Scroll saws are all about precision. With that in mind, you want to look carefully at the table and frame on your unit, to make sure the whole thing will stay still enough for you to make exact cuts without having vibration interfere with your line. The heavier the unit, the better it will tend to be in terms of vibration and noise control. Look for cast-iron frames and table tops, and as many metal parts on the other components as possible. When you’re making exact cuts, you need to have clear visibility with as little interference as possible from pesky sawdust. Scroll saws generally have two different features to deal with the dust problem. First, all scroll saws have a blower built in. They’ll have a small air pump, and a flexible hose which you can bend into whatever configuration works best for the project at hand. The blower hose clears dust from your workpiece as you cut. It’s a universal feature, and the single best way to get dust out of your sightline. The other feature you can look for is a port to connect your scroll saw to a shop vac or other vacuum dust-removal system. Unlike most other saws, vacuum dust ports aren’t standard on all scroll saws. The fact is, there’s not really a good place to put them. We’d recommend repurposing a crevice tool or other narrow vacuum attachment, and fixing it at the edge of your saw’s table with a hose attached. That’ll do a better job than any built-in dust port. However, there’s nothing to lose by trying out the built-in port on your new saw, to see if it works for you. One small feature on your scroll saw that deserves your attention is the blade fastener assembly at the end of the saw arm. Quick-release/tool-free blade changes are par for the course these days, so you should look for a user-friendly fastener system as a standard feature. However, some of these work better than others. Generally, the more expensive the saw, the better the fasteners. You should know that many cheap scroll saws have fasteners which loosen easily, so you’ll have to be sure to tighten them between every few cuts to make sure your blade doesn’t come unfastened. Some other budget models have fastener bolts that strip easily, so it’s always a good idea to have some spare ones on hand! Scroll saws cost between $50 and $500 for most models, although there are some premium units that can cost more than $1000. They’re beyond the means of most woodworkers, so we haven’t focused on any of those units here. You’ll find our recommendations on the market for between $75 and $500, depending on whether you buy with a stand or work light in the package. In our experience, it’s fair to consider anything between $50 and $250 a budget scroll saw. That’s a pretty wide price range when you’re being thrifty, but the truth is that you won’t see a drastic improvement in quality under $250. All budget scroll saws tend to be lightly-built, with fiddly and annoying adjustment features. They aren’t accurate enough for a professional or an experienced DIYer, and they have very mixed reliability. That’s why we only recommend these models to new woodworkers, and we recommend spending at the lower end of the budget range. You’ll have a lower replacement cost if your machine goes bad, and you’ll feel less bad about ditching your budget unit when you eventually move up to a nicer machine. Above $250, you’ll start to see heavier-duty machines with more metal and cast iron parts. These models are more precise, more user-friendly, and more reliable over the long term. We recommend that any serious woodworker, whether weekend warrior or full-timer, opt for something between $250 and $500. The more you spend, the more you’ll get in terms of cutting capacity, motor power, and conveniences like a quality dust blower or vacuum port. We always encourage tool shoppers to think seriously about durability with any saw purchase. It’s super important when you’re buying a scroll saw. Scroll saws are some of the least reliable cutting tools out there. They have a lot of small, delicate parts, and they have small motors which develop problems much more easily than the big industrial motors on a table saw. In general these saws have much worse reliability than miter saws, table saws and other cutting tools. That’s why we always recommend purchasing extended or additional warranty policies for these tools. We don’t recommend add-on policies for all saws, especially not those with solid warranty coverage from the manufacturer. However, when it comes to scroll saws, they’re always a good idea. Add-on coverage will give you a few more years of coverage. Most importantly, it’ll also let you get that coverage through a helpful third party, instead of the manufacturer. That’s especially handy for scroll saws because the companies who make scroll saws also tend to have the worst reputations for customer service and warranty coverage. It’s far better to spend an extra $25 up front to save paying that in shipping fees or repair costs because the manufacturer decides they’re not responsible for the cost of honoring their own warranty. Trust us — it’s better to cover your tool at the checkout, and have the extra peace of mind. To see more options that didn’t end up in our final set of recommendations, head over to Amazon to see all the best-selling scroll saws on the market!